Ballard Power Systems, a leading developer of hydrogen fuel cells, has announced a multi-year deal with Azure Hydrogen, a company working to commercialize hydrogen fuel in China. Per the deal, Ballard will be offering its services to Azure Hydrogen in its efforts to introduce fuel cells to public transportation in China. The company has been in negotiation with several Chinese bus manufacturers, working to promote the possible benefits of fuel cells and how they can be used to cut costs in the transit field. During the first phase of the partnership, Ballard will be providing licenses for its fuel cell technology to Azure Hydrogen. The company will also provide Azure Hydrogen with the necessary equipment and engineering services needed to manage the fuel cells, which will be used in buses. Azure will be responsible for the assembly of fuel cell modules that will come exclusively from Ballard. Ballard is providing the company with its FCvelocity-HD7 fuel cell modules, which are designed specifically for buses. Azure Hydrogen believes that China is becoming a very prominent market for clean transportation. Public transit is used quite heavily throughout the country and the Chinese government has begun putting a major focus on reducing the emissions that are produced by public vehicles. Hydrogen fuel has already established a strong foothold in the auto industry and fuel cells have proven that they produce no harmful emissions into the environment. Hydrogen-powered buses may, therefore, be an adequate solution to the country’s emissions problem. 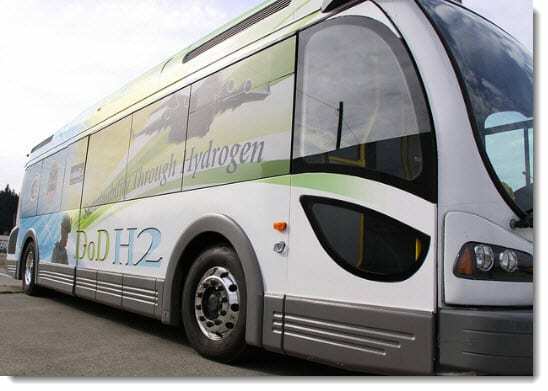 Hydrogen fuel is becoming more common in public transportation around the world. Currently, Europe boasts of the largest number of active hydrogen-powered buses. In the United Kingdom, several hydrogen-powered taxis are currently operating in London, though these vehicles are typically reserved for the transport of foreign dignitaries and government officials.